Where Do Animals Go When it Rains? | Michelle Writes!! Where Do The Animals Go When It Rains? 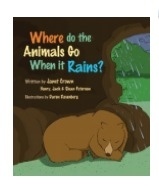 Beautifully illustrated and written non fiction book that tells the reader when animals go when it rains. There really isn’t much more that I can say about this book! I highly recommend this book and will use it my classroom during the topic of animal habitats that I will teach later this month. This entry was posted in book review, children's non fiction by learnbyme. Bookmark the permalink.